The U.S. environmental industry generated revenues of $388 billion in 2017, up from $370 million in 2016, according to preliminary estimates by Environmental Business International Inc. (EBI), publisher of Environmental Business Journal (EBJ). The environmental industry’s annual growth rate of 4.8% in 2017 represents a steady increase from 3.6% in 2016 and 2.1% in 2015. Every year, EBJ’s Annual Industry Overview presents estimates and forecasts for 13 business segments, in addition to offering perspective on how the environmental industry is responding to changing macroeconomic conditions and regulatory and policy trends. This year’s summary reviews conditions one year into the Trump Administration. To purchase EBJ’s Annual Industry Overview and receive statistical summaries of the industry in 13 segments with multiple charts featuring revenues, growth, number of companies, forecasts, growth factors and revenue breakdowns by client, media and function, visit the EBI website. The U.S. Environmental Protection Agency (U.S. EPA) recently issued the 15th edition of its Superfund Remedy Report (SRR). The report is a compilation of over 300 remedies selected in decision documents for contaminated sites on the National Priorities List (NPL) from October 2011 to September 2014. Remedies included in the document relate to soil, groundwater, and sediment. The remedies were counted by specific technology or approach, and also grouped into categories, such as treatment, on-site containment, off-site disposal, monitored natural attenuation (MNA), and institutional controls (ICs). The study analyzed remedies by media (i.e., soil, sediment, and groundwater), and the types of contaminants of concern (COCs) in those media. The evaluation also included vapor intrusion mitigation remedies. The SRR compiles data on remedies and presents separate analyses for contaminants overall and contaminants in select media (soil, sediment and groundwater). This edition also includes a separate analysis of remedy and response action data for large sediment sites. For the majority (78 percent) of the 1,540 Superfund sites with decision documents available, treatment has been selected, often in combination with other remedies. Most of these sites have more than one contaminated media, most frequently groundwater and soil. Most sites also have different types of contaminants of concern (COCs): more than half of sites address volatile organic compounds (VOCs), semivolatile organic compounds (SVOCs) and metals, while a quarter of sites address two of these groups. For FYs 2012 to 2014, remedies were selected in 308 decision documents, including 242 RODs and ROD Amendments, and 66 ESDs with remedial components. Of the 308 decision documents, 188 (61 percent) include a remedy for source materials (such as soil and sediment) and 160 (52 percent) for groundwater. Remedies were also selected for soil gas and air related to vapor intrusion. For this three-year period, nearly half of decision documents with source remedies include treatment. A quarter of all source decision documents include in situ treatment. Soil vapor extraction, chemical treatment, and in situ thermal treatment are the most frequently selected in situ treatment technologies for sources with soil being the most common source medium addressed. Physical separation, recycling, and solidification/stabilization (S/S) are the most common ex situ treatment methods. Metals, polycyclic aromatic hydrocarbons (PAHs) and halogenated VOCs are the COCs most commonly addressed. Of the 188 recent source decision documents, 39 include a remedy for sediments. 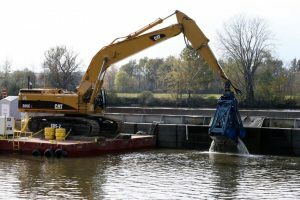 Most of the sediment decision documents (87 percent) include dredging, excavation, off-site disposal or on-site containment as part of the selected remedy. Some treatment was also selected — for example, in situ amended caps and ex situ and in situ S/S. Examples of other remedies include wetlands replacement and enhanced or monitored natural recovery (EMNR or MNR). Two-thirds of the sediment decision documents include institutional controls (ICs). Metals, PAHs and polychlorinated biphenyls are the COCs most frequently addressed. EPA also analyzed newly acquired remedy and response action data on the largest sediment sites, known as Tier 1 sediment sites. The data include 112 actions for 66 sites. Some of these actions have progressed to design or implementation. Most remedies for these sites include dredging and excavation (84 percent), 48 percent include residual caps, and 29 percent include engineered caps designed to isolate contaminants from the waterway. A quarter of the Tier 1 sites include MNR and 18 percent include EMNR. The U.S. EPA analyzed the contaminants of concern (COCs) addressed by sediment remedies in recent decision documents. Over three-quarters of these documents include metals. PCBs and PAHs are the next most frequent categories of COCs with 44 percent each, as seen in the Figure below. For the 160 groundwater decision documents signed in FYs 2012 to 2014, the groundwater remedies continue to be primarily a mix of in situ treatment, pump and treat (P&T), and monitored natural attenuation; most also include ICs. The use of in situ groundwater treatment continues to rise and is now selected in over half of groundwater decision documents. Of these, bioremediation and chemical treatment remain the most frequently selected. The majority of in situ bioremediation remedies specify anaerobic bioremediation, and more than half of chemical treatment remedies specify in situ chemical oxidation. The selection of P&T in groundwater decision documents has decreased significantly since the early 1990s and reached its lowest, 17 percent, in FY 2014. Containment technologies (vertical engineered barriers such as slurry walls) were selected at a few sites. By far, halogenated VOCs (primarily chlorinated VOCs) are the most common type of groundwater COC, addressed in 72 percent of recent groundwater decision documents. EPA selected vapor intrusion mitigation for existing structures in nine of the recent decision documents, and ICs for either existing structures or future construction in 34 of these documents. Some ICs restrict the future use of structures to avoid vapor intrusion exposure and others require the installation of mitigation systems as part of future construction. Active depressurization was the most common mitigation method specified, followed by passive barriers and subslab ventilation systems. In this report, the U.S. EPA also discusses the use of combined remedies and optimization reviews. The combined remedy highlights provide examples of recent decision documents where remedies are combined spatially or in sequence. The optimization highlights provide examples of how optimization efforts have informed remedy decisions in recent decision documents. The remedy and site information provided in this report can help identify program needs for expanded technical information and support. For example, growing use of in situ groundwater technologies suggests the need for additional knowledge and support associated with those technologies. This analysis also provides information of value to stakeholders including technology developers; consulting and engineering firms; and federal, state, and tribal remediation professionals. In particular, developers and service providers can gain insight into the demand for specific remedial technologies. The analysis of most recent Superfund decision documents shows continued selection of a full range of treatment, containment, and disposal technologies and approaches for both source material and groundwater. Selection of some remedies is increasing in frequency (such as in situ groundwater technologies), while others are decreasing (such as pump-and-treat). Remedial approaches, including in situ bioremediation, are often combined in time or space to address different areas of the site or applied sequentially. Remedy optimization and reevaluation has resulted in changes to previously selected or implemented cleanup approaches. Overall, most Superfund sites contain different types of COCs: more than half of sites with remedies address VOCs, SVOCs, and metals/metalloids, and almost a quarter of sites address two of these groups.